Pristine condition, like it has never been worn. This is a perfect dress if you want to feel like a princess on your biggest day! 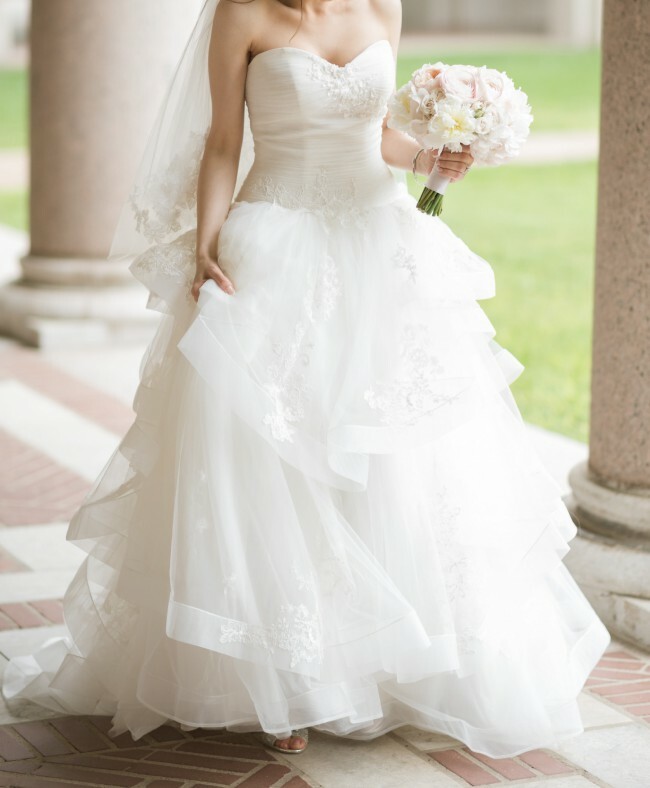 It has everything you may want in a dress: flounced tulle layered skirt, strapless sweetheart bodice, delicate asymmetrical floral net details, lace appliques, and horsehair trim, adjustable chapel train length, Back zipper and fully lined. It is super comfortable, easy to put on and stay in for the whole day. If you are US 0-2, then you wouldn't need any additional alterations. For better sizing, consider my measurements as [removed]. I like how it looks during the dance and especially when I was spinning. The chapel train is very nice for ceremony and pictures and you can clip it to the back for the reception. I also like the flower details on the back it is super delicate. The dress itself is a dream. It was worn only once with love and care. The dress was altered only in length ( to wear with 3"-4"heels) and in breast - padding was added for more fit and support to the breast. It has no flaws, it was professionally cleaned and is waiting to be worn again by another bride-to-be! Update: Ask me about the matching veil and underskirt! Once you send a message, Farah can invite you to purchase the dress.